Just because you’re slimming it doesn’t mean you have to miss out on all the Christmas treats. We’ve gathered together a selection of desserts that are low fat and low calorie. And they taste so good you’ll be able to serve them to your non-slimming friends without them feeling they’re being hard done by! Preheat the oven to gas mark 5, 190oC. Spray a baking sheet with low-fat spray. Put the apples into a bowl with the zest and juice of the lemon, the sugar, breadcrumbs, sultanas and spice. Lay 2 sheets filo pastry side by lengthways, overlapping by about half an inch. Spray with low fat spray. Repeat twice with the remaining pastry sheets. Place the apple mix in the centre of the pastry. Fold one long side to the middle then bring the other side up to overlap. Fold in both ends. Gently turn over so the seam is underneath. Spray with low fat spray and bake for about 30 – 40 minutes or until golden. Allow to cool a little and then serve dusted with icing sugar. If required serve with low fat Greek yogurt or crème fraiche. Preheat the oven to gas mark 6, 200oC. Using a knife remove the peel and the pith of 6 oranges and place them in an oven-proof dish – use a dish that is just big enough so they fit in well. Melt the butter in a small saucepan. Add the sugar, liqueur, marmalade and the zest and juice of the remaining orange. Heat gently stirring until the sugar dissolves. Pour over the oranges and bake for 30-40 minutes until caramelised and sticky. If desired serve with low fat Greek yogurt or crème fraiche. Put the sugar, orange zest and cold water in a small saucepan. Heat slowly, stirring to dissolve the sugar and then bring to the boil. Simmer gently it gets syrupy. Put the gelatine in a bowl and cover with cold water. Leave to soak for 5 minutes and then squeeze out the excess water and add the gelatine to the pan. Sir until completely dissolved. Add the champagne and Grand Marnier to the pan and mix gently. Divide between 8 glasses – champagne flutes preferably – and chill until set – about 4 hours. If you’re feeling flush, decorate with a little edible gold leaf before serving. may not sound very seasonal but made with rosy red fruits it’s a treat that can hold its own amongst the other delights of the Christmas table. To make it first prepare a syrup by adding 2 oz sugar to half a pint of water. Heat gently, stirring until the sugar has dissolved. Bring to the boil then allow to simmer for 5 minutes. Cool and add the juice of half a lemon. 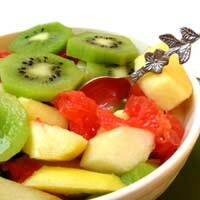 Pour the syrup into a large glass bowl and add the prepared fruits of your choice. Top with pomegranate seeds and serve with yogurt or fromage frais. You may prefer to use freshly squeezed orange juice instead of sugar syrup. Place the first 5 ingredients in a large saucepan. Heat gently, stirring until the sugar dissolves. Peel, core and halve the pears. Add them to the syrup. Bring to the boil and then simmer, covered tightly, until the pears are tender – about 30 – 40 minutes. Serve warm with yogurt or crème fraiche. Peel and chop the kiwi into small chunks. Peel the mango, take out the stone and roughly chop the flesh. Toss together with the lime zest and juice. Divide the fruit mixture between the meringue nests and serve sprinkled with pomegranate seeds.